Gartner has an interesting way of looking at emerging technologies. In their Hype Cycle, they place new technologies along a somewhat amusing continuum that extends from the inception of a technology breakthrough – the Innovation Trigger – to the Peak of Inflated Expectations (this is the hype in Hype Cycle), through the Trough of Disillusionment and on to the point where the hype is at least partially realized (the Plateau of Productivity). Although we don’t tend to get caught up in hype, we’re always interested in looking at emerging technologies and in understanding how their perceived in the market. After all, we need to make sure that we’re prepared for whatever’s coming – even if it isn’t coming overnight. Here’s a look at their most recent Hype Cycle for Emerging Tech. Not surprisingly, the technologies that are closest to reaching the point where they’re actually fully viable, broadly adopted, and having an impact on productivity are the ones that are most familiar to us: 5G and Deep Neural Network ASICs, Deep Neural Nets (Deep Learning) and Virtual Assistants. Even those technologies that are 5-10 years out from primetime tend to be household words – Smart Robots, Silicon Anode Batteries, Blockchain – at least among techies. 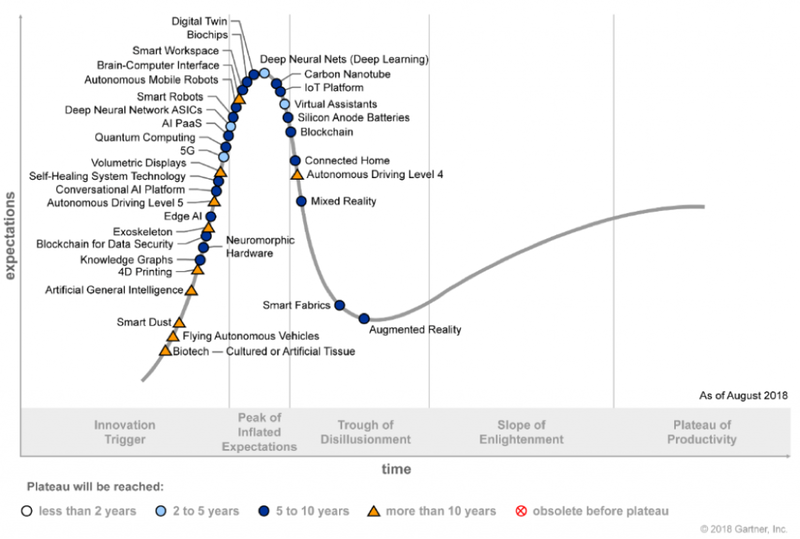 Connected Home, seen by Gartner as 5-10 years in the future, appears to be in the downward slide toward the Trough of Disillusionment. Personally, I don’t see the Connected Home being that far in the future. Nor do I see any widespread disillusionment. Sure, I think we all make a little fun of the refrigerator that calls you when you’re at the grocery store and tells you to bring milk home. But both personally and professionally, I see a lot more adoption of Connected Home devices – Nest thermostats, Ring security doorbells. Plus Gartner has Virtual Assistants as 2-5 years. I’ll concede that a lot of what those Virtual Assistants are being used for is answering questions like “who won the Superbowl in 2004?” and requests to play the Macarena. But they’re also being used to adjust the Nest and otherwise connect the Connected Home. One technology is already in the dreaded Trough – Augmented Reality – which I found pretty interesting. Don’t know whether it’s because it’s not augmented enough, or not real enough yet. Also interesting: the Digital Twin concept (5-10 years out). This is the merging of the physical and virtual worlds, in which every industrial product will have a digital representation. Intriguing! Of the technologies that are farther out, the one I’m most looking forward to – and, in some respects, most dreading – the Autonomous Flying Vehicle. Somewhere in my early childhood, I “read” a book about flying sandbox. I know that a flying sandbox isn’t quite the same as an Autonomous Flying Vehicle, but I do like the idea of doing low-level flying in a personal vehicle. I just want to make sure they’ve shaken out all the problems that autonomous land-based vehicles are grappling with, let alone the ones that are about to take flight. Looks like I have a ways to wait. In the meantime, Happy Thanksgiving from the Critical Link family to yours. The source for the Gartner graphic can be found here.